MAGe Festa 2008 come one come all!!! | FULL MOE PANIC!!! MAGe Festa 2008 come one come all!!! 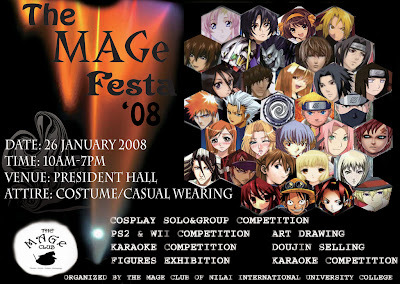 On the 26th of january ill be attending a local otaku event called MAGe Festa (MAGe= the word MAGe is a short form and combination from Manga, Anime and Game Enthusiast. )2008 in Nilai International College. There will be a few other bloggers attending as well such as: valho from toysworks, e-jump, and Likev84 from Journey Through Otakuism. Will be bringing back a report on the event, hopefully it will turn out to be good. Where it is held at? Looking forward to your coverage of MAGe Festa ^^. @rokku: the event is held in Nilai International College, Negeri Sembilan. @lanie-emon: will do. would you be going as well? Not really. Will be working this Weekend (T_T’). Just my luck. May you have fun. I expect great event coverage from you.